Music can connect two people, even if the music does kind of blow. Norah (Kat Dennings) wants to prove to her friend Tris (Alexis Dziena) that she’s capable of having a boyfriend. So at a concert, she grabs the first guy she sees, Nick (Michael Cera),and asks him to pretend they’re dating — but it turns out that Nick is Tris’s ex. 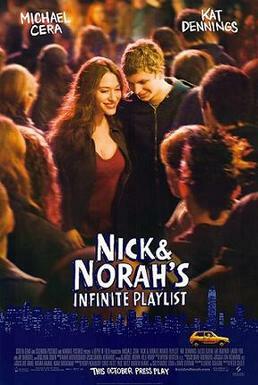 Despite the fact that they started off as a fauxmance, Nick and Norah’s relationship turns real as they traipse through Manhattan, sharing their love of music and all things weird. Imagine one night where you meet the love of your dreams but things seem to go too wrong. This is the movie for that. This is one of those films where teens seem to be bigger than life itself, where there are no rules and the night is theirs for the taking, and to be truly honest I like films like that, however this isn’t one of them. The film sort of reminds me of 80’s teenage romance films like Say Anything… or Pretty In Pink and although I really liked them I just think this one tries too hard to standout. It’s ultimately its own worst enemy, and I would’ve loved the film more if it didn’t spend so much time loving itself. The film is not as funny as it may seem. It has a lot of cheap running gags but is not as crude as you would expect from a film of this nature. I felt that the jokes were sort of dry and just put in to agree with the moment. Also many of the times the film felt very predictable when it came to those very cheap romantic touching scenes and didn’t really have me shocked by what happened next. The one thing I mostly enjoyed was the excitement of how the night looked. The situations that occurred were actually very funny and looked enjoyable and many of the characters were very likable. I felt like I wanted to be there with those same people in the same situations and be along for the ride. I enjoyed the music and thought it was actually good but there is a huge problem with the music in this film that took me away from the film. We see these characters going to clubs and exchanging music Cd’s but we never really get what really makes this music special to them. I felt that that authenticity of the film was lost and when you have a film with the words “Infinite Playlist”, I think they’re should be a lot of talk about music between these characters. Michael Cera and Kat Dennings also have a very charming chemistry that runs throughout the movie and saves it in the end. Though Cera is playing the one character that has made him a star and basically every film he still has the charm to win your heart over. Also, the supporting stars of the film are equally as good and make this film better than what it is. Consensus: Infinite Playlist is fun, charming, has a good look at the backdrop of New York, and is pretty funny. Though very flawed the film will likely go down as a classic for teens in the Facebook generation.